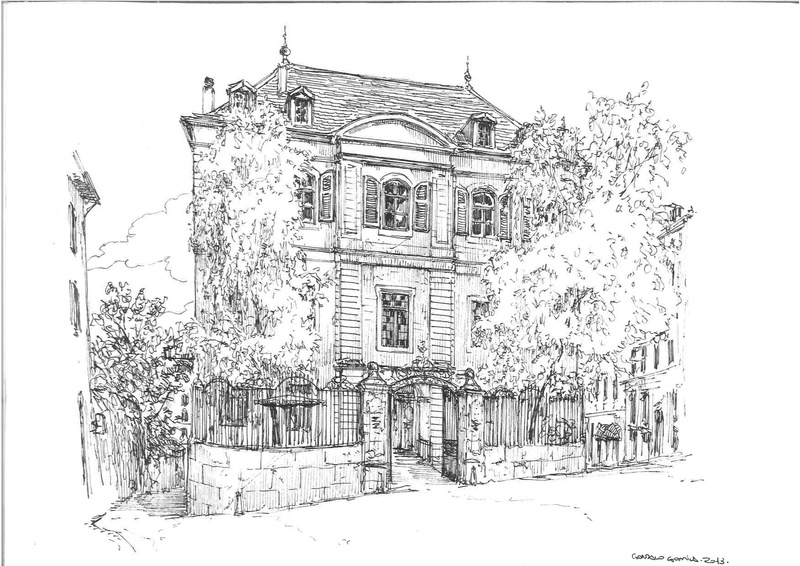 The Evangelical Lutheran Church of Geneva (ELCG) held its first worship service on August 27, 1707. A group of German merchants who traveled between Germany and Lyon, France founded the church. In the nearly three centuries since, the church has grown from a German-speaking congregation to a church with six language-based congregations: German, English, Swedish, Norwegian, Danish and Finnish. The English-speaking congregation was started after World War II as the number of international organizations based in Geneva increased resulting in a growing English-speaking community. Since then, the congregation has developed into a diverse international and ecumenical congregation. We share the church building with the German-speaking Lutheran congregation. Both congregations and the Swedish-speaking Lutheran congregation form the Church Council of the Lutheran Church of Geneva. With the help of donations from German principalities, the congregation acquires the dilapidated Château de Coudré; tears down the building (maintaining the original basement and foundation); and constructs the new church building (which, according to the regulations may not be recognisable as a church). German merchants begin bringing reformationist ideas to Geneva. John Calvin was recruited by Frenchman William Farel to join the Reformation in Geneva, where he regularly preached sermons throughout the week; but the governing council of the city resisted the implementation of their ideas, and both men were expelled. At the invitation of Martin Bucer, Calvin proceeded to Strasbourg, where he became the minister of a church of French refugees. He continued to support the reform movement in Geneva, and in 1541 he was invited back to lead the church of the city. Abolishment of the Edict of Nantes: second Huguenot refugee wave. Lutherans also lose their houses of worship. The congregation, with sole support from the six founders, has financial difficulties. They turn to the Duke of Sachsen-Gotha, Friedrich II, who’s sons were members of the congregation during their studies in Geneva. There is a temporary conflict with the church authorities of Geneva, due to the Lutherans’ violation of church rules by inappropriate behaviour, such as playing cards and visiting establishments with drink and dancing. The Geneva church council insists that the Lutherans be subjected to the Geneva Church rules, in spite of the support the Lutherans receive from the Duke in Gotha. Members of the congregation who belong to the Jacobins Guillaume Tell occupy the church and preach on their own due to their mistrust of the church directors, which are chosen only from the founder families of the church and who claim the church as their own property. Geneva authorities mediate between the parties and confirm the right of the legal proprietor. The Austrian occupational authorities use the church as a hospital. Worship services take place in the Auditore Calvin until Geneva unites with Switzerland. The church is transformed into a foundation, due to administrational reforms undertaken by James Fazy causing new laws, stocktaking of church goods, and a new name is given: Direction de l’eglise luthérienne allemande, à Genève. Request made to the evangelical church authorities in Berlin for admission as a foreign congregation causes the patronage to change from the Duke of Gotha to the German Emperor. 200 year celebration of the German Congregation; establishment of church choir (first organ in 1892). Right to vote within the congregation for women; since 1921 possibility to vote women into the management of the church (against the will of higher church counsel). first ‘Gemeindebote’ (German news letter) with around 500 copies until 1952. Renting of one community room (Promenade St. Antoine, later rue Tabazan). Joining of the German Evangelical Church Union. Adjustment of the laws to the Swiss association law. Being subjected to Swiss law, the assets of the church are protected. The German Lutheran Church becomes the Evangelical-Lutheran Church of Geneva: admission of English speaking and Scandinavian congregations, establishment of church council. Contract with EKD, communion becomes the centre of the worship service. Youth Group (up to 120 18-25 year olds, ecumenical). 250 year celebration; renovation of sanctuary (1969 new organ). published copies of news letter (Gemeindebote) increase to 1600. Women organise charity bazaar; regular aid of developing countries (soon to be 10 % of budget). Introduction of the coffee hour in renovated community room (Gemeinderaum). The church becomes a member of the Organisation of Churches of Geneva. New constitution of the ELKG establishes equality of German and English speaking congregation (common church council supports the building). Extensive renovation and redesign of sanctuary (round altar); worship service together with Swiss German reformed church in Church de la Madeleine. Member at the Organisation of Evangelical-Lutheran churches of Switzerland. Participation in the foundation of the Platforme interreligieuse de Genève. So, how about 1766 ? * Mozart ten years old. * (Wrote his first symphony at age 8, during the construction of our building). * Britain forcing the "Declaratory Act" on the 13 North American colonies. * Ten years before American Independence. * German states not yet united, but Prussia rises to effective equality with Austria after the 1742 Treaty of Berlin. * Colonization (1763-1767) of Volga areas by Germans - invited and subsidized by Katherina.